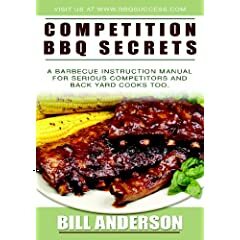 For serious competitors and backyard enthusiasts, Competition BBQ Secrets by Bill Anderson is a winning combination of expertly honed skills and hometown flare. Whether it’s chicken, ribs, butts or brisket, this cookbook has recipes, directives, insights and guidance on how to slow cook competition-quality meats. Better than any restaurant, these competition and backyard secrets will have beginning barbeque aficionados slow-cooking masterpieces in no time at all. In twenty easy to read chapters, with titles such as “Regional Barbecue Sauce Variations,” “BBQ Competitions: What you need to get started,” “Barbecue Recipe Science” and “Collagen, Protein, and Fat,” readers learn the details on exact times and temperatures so there is no room for error—and that’s the point. It is what distinguishes this barbequing cookbook from all others—the author cuts away the bone and fat to get to the meat of the matter. © 2019 Flaming Food | Log in | 132 queries. 0.649 seconds.